What happens to tap water when you are away from home? 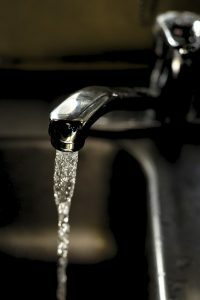 Day-to-day water stagnation in building plumbing can potentially result in water quality deterioration (e.g., lead release or pathogen proliferation), which is a major public health concern. However, little is known about the microbial ecosystem processes in plumbing systems, hindering the development of biological monitoring strategies. Here, we track tap water microbiome assembly in situ, showing that bacterial community composition changes rapidly from the city supply following ~6-day stagnation, along with an increase in cell count from 103 cells/mL to upwards of 7.8 × 105 cells/mL. Remarkably, bacterial community assembly was highly reproducible in this built environment system (median Spearman correlation between temporal replicates = 0.78). Using an island biogeography model, we show that neutral processes arising from the microbial communities in the city water supply (i.e., migration and demographic stochasticity) explained the island community composition in proximal pipes (Goodness-of-fit = 0.48), yet declined as water approached the faucet (Goodness-of-fit = 0.21). We developed a size-effect model to simulate this process, which indicated that pipe diameter drove these changes by mediating the kinetics of hypochlorite decay and cell detachment, affecting selection, migration, and demographic stochasticity. Our study challenges current water quality monitoring practice worldwide which ignore biological growth in plumbing, and suggests the island biogeography model as a useful framework to evaluate building water system quality.